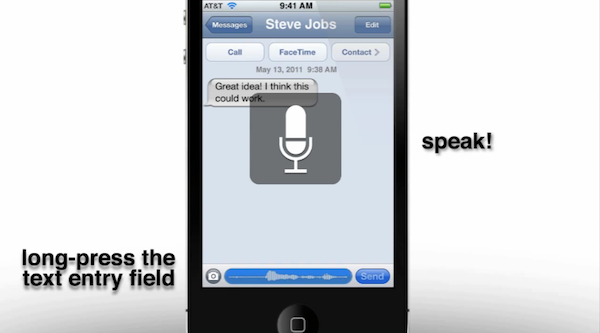 With far improved voice recognition expected to make its way into iOS 5, the next questions is how Apple will implement it. Well one person, Jan-Michael Cart, has thought of how it might be possible to implement and put together a well-thought out video demonstrating the concept (after the break). There are number of aspects to the voice recognition he conceptualizes, starting with the notion that it can be used to navigate the entire user interface and is triggered by holding down the home button – much like how Voice Control currently works. Yet instead of bumping you to a whole new screen like Voice Control does, the status-bar will turn blue and serve as a visual guide as to when to speak and telling you how it interpreted what you said. That’s a fairly straightforward extension of what iOS currently does, what is more intriguing is Jan-Michaels concept of how any text-field can have voice input. All you would have to do is press and hold the text-field and again the status bar turns blue and you speak. For somewhere like notes or mail (which don’t have a text-field but rather an area for a block of text) you would double tab to open the copy and past bar but which would also now have a microphone icon – pressing it would start voice dictation. As would be reasonably expected, Jan-Michael also believes that APIs would be offered to developers to use voice-recognition and shows how the Facebook app would be an easy candidate for voice recognition support. Make sure to jump the break to watch the video by Jan-Michael, and if you like it, I would highly recommend checking out his YouTube page which has some other iOS 5 concepts including faster app switching using gestures and how widgets could be implemented.